Replacing injured starter Jay Cutler (chest) early in the third quarter, Miami Dolphins backup quarterback Matt Moore helped his team overcome a 14-point deficit in the fourth quarter to secure a 31-28 win in the final seconds over the visiting New York Jets. Moore completed 13-of-21 passes for 188 yards and two touchdowns – both to wide receiver Kenny Stills – against one interception in relief of Cutler. Jets quarterback Josh McCown completed 17-of-27 passes for 209 yards and a season-high three touchdowns against one interception, but his arm went cold when it mattered most. The Jets’ offense totaled negative four yards in the final quarter of play, paving the way for Moore-led Dolphins comeback. Defensively, Dolphins’ Reshad Jones led the team with seven tackles. With that, we give you our PFF exclusive takeaways from the contest for each team. Filling in after Jay Cutler went down in early in the third quarter, Moore made a number of big throws down the stretch in the comeback win. 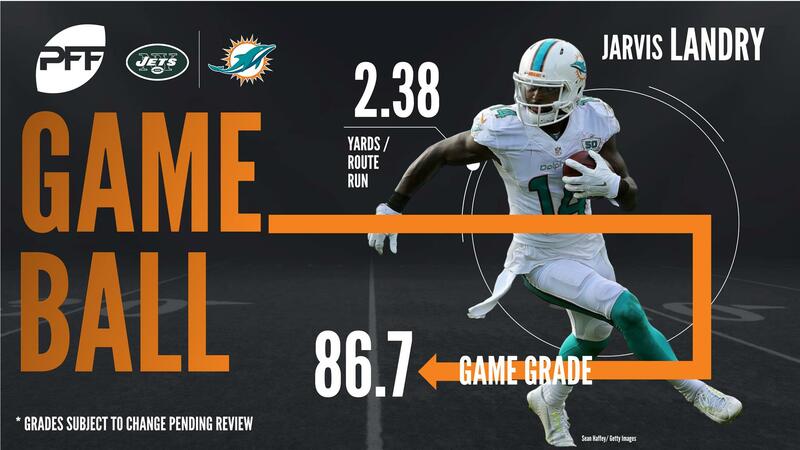 Moore consistently gave his play makers a chance to make a play on the ball, finding Kenny Stills on a corner route versus an all out blitz for a 28-yard touchdown, and connecting with Jarvis Landry on a 29-yard back-shoulder throw, setting up the game tying touchdown. On the day, Moore was at his best when the Jets did not blitz, going 11-of-13 for 143 yards, a touchdown, and a 138.1 passer rating on such throws. No matter which defenders the Jets matched up on Landry he managed to have success, catching passes on five different defenders on a multitude of routes. Landry was targeted 10 times total on the day, catching seven passes for 93 yards and touchdown. Landry’s had two clutch plays on the final game-tying touchdown drive, catching a crossing route and picking up big yards and leaping over a defender in the process, followed by a nice back shoulder catch that set up the game tying touchdown. Suh was his usual, dominant self in the middle of the Dolphins defense all game. Against the run, he consistently blew up plays, despite not making any run stops. His run-defense grade of 87.2 shows just how unblockable he was for the Jets offensive line. He was no slouch in the pass game either, as he recorded a sack, a hit and four quarterback hurries on 28 pass-rushes. It was a big game for Wake, as he managed to rack up three sacks rushing the passer. He also had three quarterback hurries, and drew a couple of holding penalties with his pass-rush. He got those six pressures despite only rushing the passer 18 times. His pass-rushing productivity score of 29.2 for the game is very impressive, and he led all players in this game with an 86.3 pass-rushing grade. The Jets started strong thanks to strong play from McCown, who led the Jets to a couple early touchdowns and ended up accounting for all four scores, however he had a lot of problems too. When under pressure, McCown completed just 4-of-10 passes for 56 yards. He was 8-of-8 on passes thrown behind the line of scrimmage and 9-of-18 on passes ahead of it. Of course, there was also his absolutely terrible interception in which he misread the coverage deep in his own territory late that essentially cost the Jets the game. This was a turn-back-the-clock game for Forte, who made his limited touches count in a big way. While having just seven rushing attempts, he picked up 41 yards with 33 of them coming after first contact. He also forced three missed tackles on those carries. He came up even bigger in the pass game, as he caught all five targets he saw for 41 yards and forced six missed tackles, four of which came on a big third down conversion early in the game. That works out to an absolutely silly elusive rating of 353.6 for the game. The Jets were able to hold the Dolphins running game in check with Darron Lee leading the way. The Jets defense gave up just 2.1 yards per carry for a total of 53 yards, including an astonishing one yard before contact. Lee was shedding interior blocks all day, totaling five solo stops as well as securing a quarterback hit rushing the passer. Skrine struggled throughout the day, with a number of penalties and he gave up plenty of big plays down the field. Overall he was targeted 7 times, giving up 7 catches for 119 yards 3 touchdowns and a perfect passer rating of 158.3 in coverage. Skrine was beaten for touchdowns on the final two scores for the Dolphins.